Those idiots from the Hangover franchise have nothing on Jos Vreeswijk, who is about to wake up next to a dead body, a smoking gun, and no memory of the last twenty four hours. He has one day to get it all sorted if he wants to make it to the church in time for his wedding in Arne Toonen’s Black Out (trailer here), which screens during the 2013 Brooklyn Film Festival. Vreeswijk was once a criminal, but he went straight. It seemed to take, up until the point he woke up with a corpse in his bed. His fiancée Caroline knows he has a shady past, but she accepts him nonetheless. His prospective father-in-law is less understanding, but he seems to be up to his eyeballs in the mess enveloping Vreeswijk. Evidently, it involves twenty kilos of cocaine two rival gang lords think he owes them. To get back to the straight-and-narrow, Vreeswijk will have to boost somebody else’s coke. There seems to be plenty around, but holding onto it is a trickier proposition. 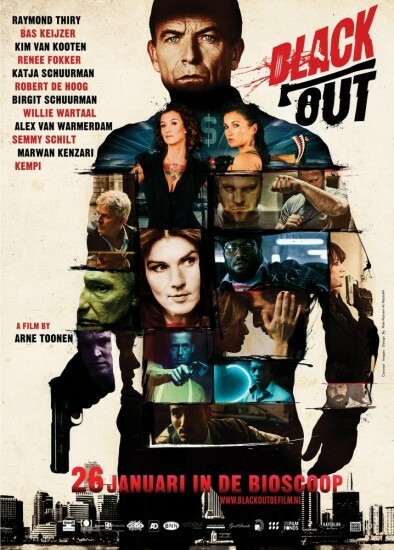 Black Out is a darkly comic, slightly cartoony criminal caper which hums along quite energetically. You have your ballet dancers-turned Russian mobsters, psycho baby doll enforcers, malevolent grandpas, and out of their depth dog groomers all getting in on the action. Yet, it is the steely Robert Conrad-esque Raymond Thirry who anchors the bedlam quite effectively as the reformed everyman, Vreeswijk. Despite all the betrayal and confusion exploding around him, he is always manly and never whiny. Likewise, Kim van Kooten is pleasantly down to earth and pragmatic as the innocent Caroline. All the crazy acting out is left to the rest of the cast, who gorge on scenery like a Bonanza buffet. Arguably, the subtlest, most intriguing supporting character is Renee Fokker’s Inez, the “Connoisseur of Coke” and formerly Vreeswijk’s close associate. Tonnen is obviously influenced by Tarantino and the recent bumper crop of Scandinavian noirs, but even if he never reinvents the wheel, he keeps things punchy and pacey. Violence and eccentricity are liberally mixed together, but Black Out still feels fresh thanks to Thirry’s grounded center. A slickly entertaining one-darned-thing-after-another gangster romance-beatdown, Black Out is recommended pretty enthusiastically for genre fans when it screens this coming Sunday (6/2) and Monday (6/3) at Windmill Studios, as part of the 2013 Brooklyn Film Festival.